4-year-old brings bullet shell to school and mom goes viral with her reaction. Illinois mom Kristy Jackson's 4-year-old Hunter son was suspended from his pre-school after he brought the casing of a fired bullet in, presumably to show his classmates. According to a Facebook post Jackson uploaded on March 21st, the preschooler faces a 7-day suspension for bringing the casing to school, and could face expulsion if his "enthusiasm for guns continued." 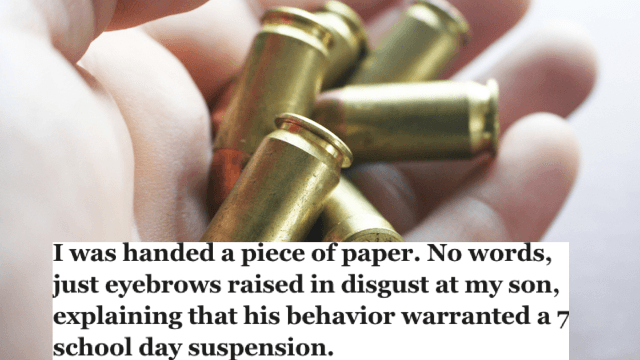 Jackson defended her son, noting that he must have picked up the bullet shell while he was spending time with his police officer grandfather over the weekend. Her post has gone viral, and has been shared over 4,500 times. Today, I picked up my happy little 4 yr old from preschool, at A Place to Grow, in Troy. My arrival was met with a stone faced teacher, who told me that Hunter brought a "shotgun bullet" to school.
? I was horrified. My kid? Who just spent the weekend learning gun safety? Well....when I was escorted to the office for a sit down. I was handed a tiny .22 empty brass casing. Not a "shotgun bullet". He found it on the ground, expelled from a 22 Rifle over the weekend, while Hunter was target practicing with his Police Officer Grandpa. He was so excited, and snuck it to school to show his friends. We had no idea about it. I was handed a piece of paper. No words, just eyebrows raised in disgust at my son, explaining that his behavior warranted a 7 school day suspension. Which I still was expected to pay tuition for, of course. And a threat that if his enthusiasm for guns continued, he'd be permanently expelled. Not only was this mom upset with the suspension itself, but she also felt that teachers missed a valuable opportunity to educate her kid and chose to punish him instead. See, here's the thing. This was a teaching moment. He never hurt anyone, or threatened anyone. This could literally happen to ANY CHILD who happened to find one on the ground and thought it was cool. He does not have access to ANY weapon in our home. This could have been handled by explaining appropriate behavior at school. He's 4. This doesn't hurt him, or teach him, or help him. Just his parents, who do not condone bringing these kinds of things to school. Ever. Had we known, we of course would have stopped it. But every time he or another child mentions a gun (like every boy I grew up with did) they punish him. Jackson returned to Facebook three days later to address the mixed reactions she was getting on her original post. It's an odd thing, to see your son's character debated in the public. I suppose I brought that on, by posting my frustration on FB. I didn't go to the news, they came to me, saying they were running the story anyway. But the fact is, this is a very liberal school. With an AMAZING cirriculum, and sweet teachers. But they are very anti gun, anti hunting, ect. Jackson also clarified what the school meant when they brought up her son's "history" with guns in the aforementioned post. The things my son got in "trouble" for have been talking about his hunting trips with Grandpa, make believe play like cops and robbers, and picking up sticks on the playground along with other boys, and pretending to shoot these sticks. That's this "history of bad behavior". I don't think that makes my son bad. But there are people who don't agree. That's ok. I support your right to think that. But you see, K-12 kids, by law, can only be suspended for 3 days max, in IL. He's 4, and only in Pre-K. He got a 7 day suspension. Is that fair? I do not have a problem understanding their rules. We knew we put him in a very liberal school. We have a problem with the extreme consequences. Thanks for reading, even if you may disagree. What do you think? Did the punishment fit the crime?